Phytase is used in agriculture to mobilize indigestible phosphate compounds in livestock feed. Phytase, with phytic acid in atomic colors. The availability of phosphorus often limits growth in competitive ecological communities, and living things have found ways to get their share. We get our phosphorus in the foods that we eat, nicely packaged into useful molecules such as nucleotides and phosphate ions. Plants must make do with resources that circulate to them, and they often hoard the phosphorus they find in an unusual molecule called phytic acid (or more technically, inositol hexakisphosphate). It is stable and almost indigestible, unless you have the proper enzymes to break it into useful pieces, which causes special problems in agriculture. Livestock are often given plant-based feed, such as soybeans, which is rich in phytic acid. Cattle, with their many stomachs, have bacteria that can break the phytic acid down, releasing nutritional phosphate molecules. Pigs and chickens, however, only have a single stomach, and most of the phytic acid passes right through. This limitation causes two problems: the animals need another source of phosphorus to grow, and the phytic acid in their manure can cause severe problems, such as toxic algae blooms, if it is released into the environment. To solve both of these problems, livestock feed is often supplemented with phytase enzymes, which break down the phytic acid in the animal’s stomach. Phytases are small, acid-stable enzymes that progressively break off the phosphate groups from phytic acid. Two similar types are commonly used as feed supplements: one from bacteria, shown here from PDB entry 1dkq, and one from mold, as seen in PDB entry 1ihp. The biotechnology community has also worked diligently to engineer more heat stable and more active forms of phytases, making them better and better for large-scale agricultural use. Four classes of phytases. 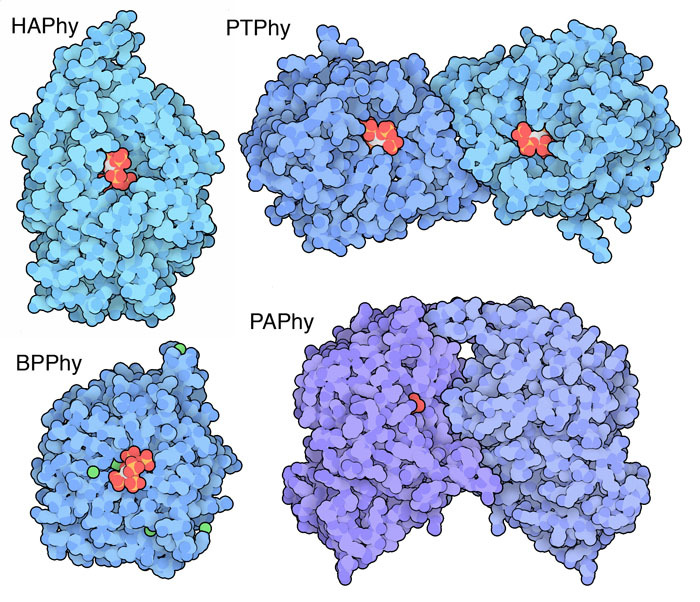 Three of these structures have phytic acid or a close analog bound in the active site, and the PAPhy has phosphate. Since so many living things eat plants, it’s not surprising that they have evolved many different types of phytases. Researchers have classified these into four general categories based on their structures. Histidine acid phytases (HAPhy), like the phytases used as feed supplements, have a histidine to perform the reaction. Beta-propeller phytases (BPPhy, PDB entry 3amr) are named for their unusual protein fold. PTPhy phytases, such as the one in PDB entry 3mmj, are similar to protein tyrosine phosphatases. Purple acid phytases (PAPhy, PDB entry 4kbp) contain metal ions and have a purple color. The phytase AppA from Escherichia coli uses a histidine in its reaction (magenta), which is activated by a neighboring aspartate (pink). 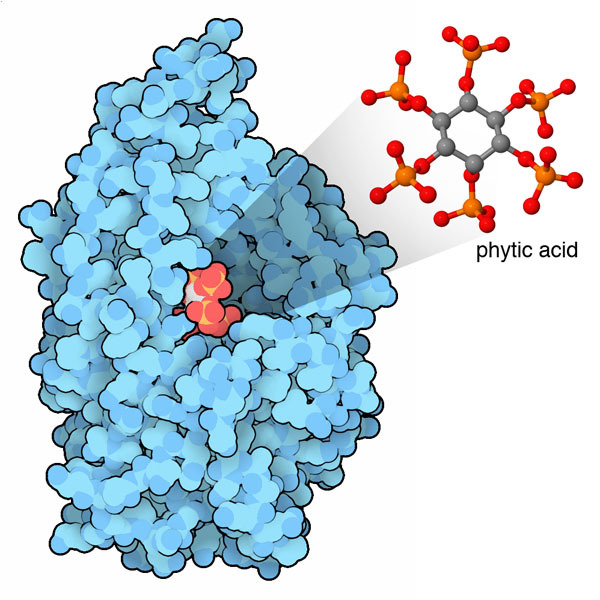 Phytic acid, because of its many phosphate groups (in red and orange), carries a strong negative charge, so it is recognized and positioned by an array of positively-charged arginine and lysine amino acids (in blue). To explore this structure in more detail, click on the image for an interactive JSmol. Phytic acid is thought to play many other roles in cells, particularly because of its antioxidant properties. The Ligand page for inositol hexakisphosphate has links to structures of it bound to other proteins. Try searching for “inositol phosphate multikinase” at the RCSB PDB site to see a few of the enzymes that help build phytic acid. Lei, X.G., Weaver, J.D., Mullaney, E., Ullah, A.H., Azain, M.J. (2013) Phytase, a new life for an “old” enzyme. Annual Review of Animal Bioscience 1: 283-309. 3mmj: Gruninger, R.J., Dobing, S., Smith, A.D., Bruder, L.M., Selinger, L.B., Wieden, H.J., Mosimann, S.C. (2012) Substrate binding in protein-tyrosine phosphatase-like inositol polyphosphatases. Journal of Biological Chemistry 287: 9722-9730. 3amr: Zeng, Y.F., Ko, T.P., Lai, H.L., Cheng, Y.S., Wu, T.H., Ma, Y., Chen, C.C., Yang, C.S., Cheng, K.J., Huang, C.H., Guo, R.T., Liu, J.R. (2011) Crystal structures of Bacillus alkaline phytase in complex with divalent metal ions and inositol hexasulfate Journal of Molecular Biology 409: 214-224. 1dkq: Lim, D., Golovan, S., Forsberg, C.W., Jia, Z. 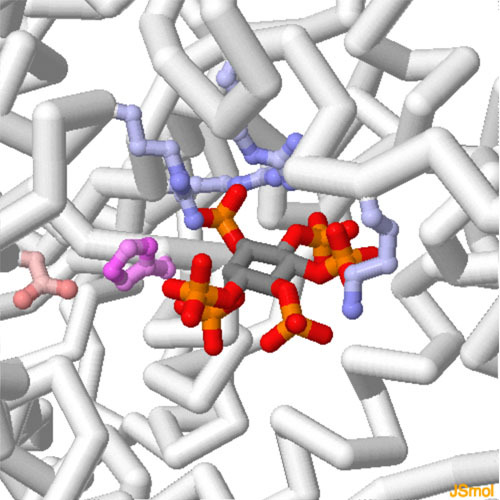 (2000) Crystal structures of Escherichia coli phytase and its complex with phytate. Nature Structural and Molecular Biology 7: 108-113. 4kbp: Klabunde, T., Strater, N., Frohlich, R., Witzel, H., Krebs, B. (1996) Mechanism of Fe(III)-Zn(II) purple acid phosphatase based on crystal structures. Journal of Molecular Biology 259: 737-748.